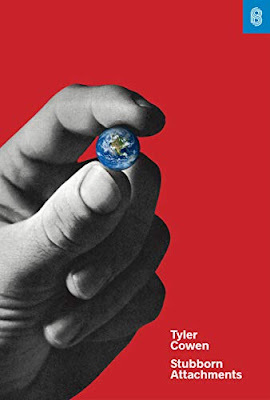 Tyler was good enough to give me a review copy of his new book, "Stubborn Attachments: A Vision for a Society of Free, Prosperous, and Responsible Individuals", so here is my review! This is a philosophy book. It tries to answer the question of what a society's priorities should be. That's interesting, because Tyler is usually a very circumspect guy who doesn't like to come out and make strong value statements. So it's cool that he's finally telling the world, in no uncertain terms, what he thinks society should be all about! There are two things about the way Tyler approaches philosophy that I really like. First, he's very informal, and doesn't bother to painstakingly define terms or refer to things other philosophers have said. That would probably annoy some people in the academic philosophy field, but it makes the book extremely readable even for a layperson. Second, he doesn't try to set out an absolute, formalistic, fully internally consistent system of ethical principles - instead, he embraces an eclectic, often conflicting set of principles. This is refreshing, since rigid systems always prove fragile to intuitive counterexamples. Too much of ethical philosophy seems to consist of people finding intuitive counterexamples to rigid systems of principles, forcing advocates of those principles to redefine them in a way that wouldn't invite those counterexamples. As a sort of a Humean, I kind of believe that people's ethical systems are all just derived from moral intuition, and aren't really internally consistent, and never will be, and thus shouldn't have to be. It's therefore refreshing to see Tyler embrace a sort of eclecticism, where he draws at will on several different principles. This sort of philosophizing has very little formal discipline to it - it's basically just saying "Here's what I think is good". But so what? That's basically what we always end up doing anyway. Anyway, OK, on to the actual ideas in the book. Basically, the book is an argument that long-term growth is the most important thing a society should strive for. The reason is that future people are just as important as present people, and the future is extremely long, so there are lots of future people. Thus, making sure we keep growth going is the most important thing we can do, morally speaking. Importantly, Tyler makes sure to include sustainability in this calculation. Growth in technology doesn't matter much if the planet is unlivable. This point is inserted as a caveat, and deserves more attention throughout the book than Tyler gave it; he should have talked a bit more about environmental policy. But it's good that he put that qualification in there. Tyler's moral reasoning appeals to me; I strongly agree that we should care more about future generations. But the problem with this idea is that it doesn't lead to a lot of actionable policy ideas. Tyler seems to think that laissez-faire economic policies are often pro-growth. But this is usually only true in the slang sense; most economists would say that cutting taxes or cutting harmful regulations raises efficiency, but not steady-state growth. It seems unlikely that a change in the top marginal tax rate from 40% to 25%, say, would compound over the centuries into living standards that are hundreds of times higher. In a typical Econ 101 setup or Ramsey growth model, the tax cut would simply bump up GDP a bit, and then growth would continue as before. The big exception to this is Romer-type endogenous growth. If a slightly higher GDP results in a slightly higher research expenditure, which discovers a slightly higher number of new ideas, which leads to a slightly higher GDP, etc. etc., then the long-term benefits of anything that raises GDP today are absolutely enormous. But how much do we really believe that model? Did the Industrial Revolution - the greatest explosion of human living standards ever observed - start in Britain and the Netherlands because GDP was a bit higher there, which allowed the economy to support a higher number of researchers? Maybe, but I think even Paul Romer would be incredibly skeptical about that historical story. Instead, there were probably some institutional or contingent factors at work. Which brings us to my main problem with Tyler's big thesis - what are the actionable ideas here? Tyler mentions the problem of uncertainty - the fact that we don't really know what will lead to sustainably higher growth - but IMHO ultimately doesn't deal with it to my satisfaction. The Industrial Revolution was the biggest sustained growth success story in the history of the human race. But now imagine you're an administrator in Ming Dynasty China in the 1400s. What policies do you recommend in order to make China industrialize? Even with the benefit of centuries of hindsight, the answer is not obvious at all. You can dig up coal, build factories, etc., but plenty of countries tried this approach with disappointing results. Even now, we don't know what combination of factors allowed Britain to succeed (accidentally!) at industrialization when other countries' later, deliberate attempts failed. And if we don't know the magic growth-shifting policies in hindsight, how likely are we to know them ahead of time? This goes double for sustainability. The Industrial Revolution was amazing, but there's still some chance - small, in my opinion, but real - that the whole thing will cause the death of the planet's environment and make it permanently uninhabitable for the human race. If so, we might eventually wake up and realize that we would have been better off staying as subsistence farmers, trapped by the Malthusian ceiling, for many thousands of years, instead of enjoying a few centuries of doomed affluence. (Note again: I think this is unlikely, but it's hard to rule out). BUT, that said, I do think there are a couple things that we can focus on that are more likely than not to result in super-long-term sustainable growth improvements. These two things are scientific progress and technology that enhances environmental sustainability. The more ideas humanity knows, the higher the probability that the increase in our choice set gives us access to things that raise super-long-term sustainable growth. So, science. And the more tools we have to reduce our use of finite resources, the higher the probability that our choice set includes futures where we don't destroy ourselves by destroying our environment. So, sustainability tech. Thus, "Stubborn Attachments" reads to me more like a manifesto for basic research and green technology than a manifesto for laissez-faire economics or any of the other things that commentators call "growth policy". If we want to leave a much better world for our infinite future generations - and to maximize the infinitude of those generations - basic research and green technology are our best bet. As Rob Wiblin pointed out, decreasing existential risk also would increase the expected long-term life quantity/quality. Such as from pandemics and nuclear war. There's a typo in the second paragraph; 'things' should be 'thinks'. "or contingent factors at work." What did you have in mind here? Even if you don't believe that the Romer model can explain how the IR started, it might still tell you how to inrease growth in industrialized countries. Apart from that: Accepting the points you make should increase the status of the study of economic growth. How about encouraging more people to get a PhD in economic history, development economics or macroeconomics? Or how about encouraging more people to really produce economic growth themselves by founding innovative businesses or making existing processes in business, politics or elsewhere more efficient? In general, thinking about the future should in itself be more encouraged. Maybe we should encourage reading more science fiction and watching kurzgesagt videos to stimulate thoughts about the distant future. A lot of science / discovery seems to happen within firms. German / Japanese policy that prevents downsizing of advanced technology firms seems good. I also think big firms do less to crowd out new techs than they do to foster it by training workers up to cutting edge, funding copycat attempts of emergent techs, acting as a client and exit route for startups, paying large salaries to smart people who can fund startups from inside or outside, and introducing smart people to each other in the workplace. Demand-management policies that reload firms with funds seem good, too, as do policies diverting firm income away from financial engineering. "Which brings us to my main problem with Tyler's big thesis - what are the actionable ideas here?" This is surely overstated. We know an awful lot about what promotes economic growth: don't go to war, aim for high employment, avoid deflation, aim for low but positive inflation... I think all of these are massive policy lessons that humanity genuinely didn't know 100 years ago. Even more important, I'd like to suggest a new one, which I think Cowen doesn't address, curiously: set up your state to grow, as in China. China made GDP growth the key KPI for bureaucrat success, and they obtained growth. A growth orientation could easily drive changes in the shape of the state like: how many people does the state employ to deliver justice vs growth, and what should that ratio be? Market enthusiasts may not like the idea of pulling growth into the government ambit, but those more open to the idea of state intervention might accept it. Didn't British GDP growth average 2% 1800-1870? Even slower average wage growth and average heights not getting back to what they were in 1730 until 1900 doesn't seem like a good sign. Why is this "greatest explosion of human living standards ever observed"? Post WW2 growth seems better.